Insulating your garage door means more than just attaching some Styrofoam to the back of the door. Proper garage door insulation also requires good flexible seals around all edges of the door as well. The good news is, the insulation and seals are fairly inexpensive and very easy to install. Garage door weatherstripping and seals are readily available at most home improvement stores, while many online sources such as Amazon.com offers Garage Door Insulation Kits. 1. Insulating is a great way to reduce your energy bills. This is especially true if the rest of your garage (including the ceiling) is already insulated. You may even qualify for an energy tax credit. 2. By sealing the door of your garage with proper weatherstripping, you can keep dirt, debris, leaves, bugs, snakes, and rodents away from your garage. 3. A sealed garage door protects your vehicles, and tools from the damage caused by cold air, moisture, and rain. This is very important if you live near the ocean and windblown salt water is often in the air. 4. Insulation reduces the intrusion of unwanted noise from the outside, which can be helpful to you if you happen to live on a busy street. It also reduces operational noise, which allows you to work on noisy projects without disturbing your neighbors. Should You Insulate a Garage Door in a Hot Climate? 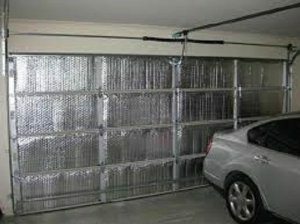 The Con to insulating your garage door is that it will help retain heat from hot automobile engines within the garage. This heat may transfer into your living space during a hot summer day. However, I personally found great benefit to insulating the metal garage door on my Phoenix Arizona home. The scorching afternoon sun literally baked the garage doors, heating the entire 3 car garage. Heat rises and the upstairs bedrooms above the garage were very difficult to keep cool. After insulating our garage doors, there was a very noticeable drop in the temperature upstairs. I would simply leave the garage doors open for a half hour after parking the car, and ran a box fan to exhaust the hot air out of the garage door (not recommended for crime ridden neighborhoods). As you can see – installing garage door insulation is an easy and rewarding project. It can be accomplished in under an hour and it is an inexpensive energy saving improvement that anyone can do. 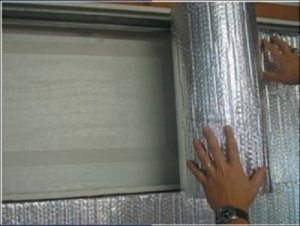 What Type of Garage Door Insulation Should I Buy? 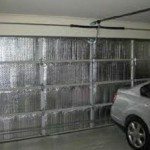 There are several different types of material used to insulate garage doors. 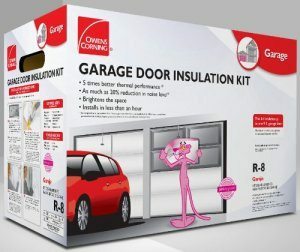 The leader in fiberglass insulation makes a kit for garage doors which uses their trademark pink fiberglass batting mated with a bright white vinyl backing. This kit uses clips to hold it to the door, but many users complain that it sags when the door is opened. Many customers also had to use duct tape to hold the fiberglass in place. Also if you have windows in your doors, there is no good way to cut the insulation around them without the pink insulation showing. Some users spray painted it white on the edges to match, but I think this is too much work when other alternatives exist. While it does offer decent insulating properties with an R-8 value, the Owens product is not my first choice. Being fiberglass it is somewhat a pain to work and is certainly not the most attractive option. If you want to go with this named brand product you can find it here. A Better Option is this Low-E Reflective Foam Core Double sided product. This kit fits most standard 4 panel garage doors and uses a double sided adhesive tape to secure it to the door. This product while offering the highest r-value is value priced as seen here at Amazon.com. This product works great. The only negative is it’s not the most attractive offering, unless you are going for an intergalactic spaceship theme in your garage. This insulation kit has an R-4.8 rating, that will make a noticeable difference in the comfort level of your garage. Although not the highest in insulating properties, it is the most attractive option and essentially the same OEM grade insulation used by garage door manufacturers. Here’s a video showing the easy installation. Be sure to visit our Garage Door Seals page to find out how to properly install garage door seals and the the different types available.